Ready or not, lambs and kids should start arriving this month. Delaney ask me every day how many more days??? Last night she was talking about lambs coming next week...I said No, not until April..she was not happy. We pulled out the calendar and counted out 147 days (average gestation period of a ewe) and it looks like it is possible we could have lambs the very end of March. She was happy to hear that it could happen this month. She has been looking at the blogs I have been following and seeing all of those cute lambs and kids have almost been too much. Every time she sees a new post with some cute babies I hear "Everyone has lambs, but US!" I love lambs and kids but as long as the weather is cold I am okay with waiting. Right now there is snow on the ground, more snow than we have had all winter, I think. daffodils, tree buds, and yes, farm babies. Delaney asked if we could have a contest. A contest where you guess the date of our first lambs, the color of the lambs and if it will be a single, twin or triplet (we hardly ever have triplets) and gender. I am going to a fiber event this weekend so I am pretty sure I will be able to find something fun for a giveaway. You can check back in the beginning of April to see if you won! P.S. We can't leave the goats out of the fun so we will be posting a kidding contest too. It all has to be fair you know. 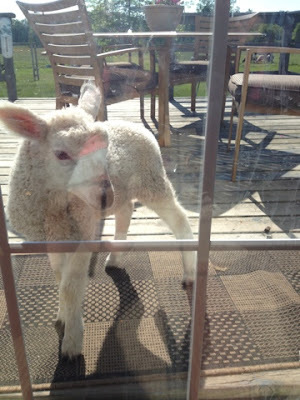 Grandma Wilson is guessing on April Fool's day a white (single) ewe lamb. I'll guess Easter Sunday, twins, a ram and a ewe lamb, the ram being white and the ewe being natural. I don't think I'll breed for so early again. It's been so cold I have had to put sweaters on the lambs born yesterday. But they do look too cute in them. And the goat kids do too, little stinkers. Border Leicester Twins on March 28th; 1 Ewe and 1 Ram. Looking forward to lambing posts in April! I need to work on a calving post. We have over 20 babies on the ground. Hi Sandra! I wanted to stop by and thank you for your comment and for sharing at the Blog Fest. Feel free to resize the graphic if you'd like to, I see that it's quite large for your template. I'm following you now, and looking forward to getting to know you! I figured out how to resize..thanks! Great idea for a contest! I'm going to go with April 4th. one white ewe, and one natural ram!! Good Luck everyone! I hope spring decides to show up before the lambs start coming!! !